Each year, HRO Today Magazine surveys Human Resources and other stakeholders to gauge their overall satisfaction with and evaluate the overall performance of their relocation service providers. 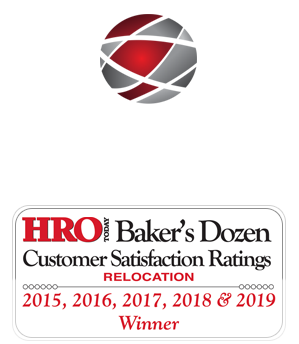 Based on their feedback, the magazine compiles its prestigious Relocation Baker’s Dozen, an objective ranking of the top thirteen relocation management companies. The Baker’s Dozen is an award based solely on customer feedback in three categories: quality of service, size of deals and breadth of services. The rankings are created using anonymous feedback from Human Resources and procurement professionals from current and former clients of 200+ employee relocation management companies. Established in 1963, MoveCenter is a multi-generation family-owned and operated Relocation Management Company providing services in 150+ countries. As the oldest Women’s Business Enterprise in the relocation industry, our clients include Fortune 500 multi-national conglomerates, privately owned companies, and government agencies. Our goal is to simplify relocation to provide cost efficiencies and VIP customer service, ultimately supporting individual clients unique recruiting and retention goals. We operate as a boutique style company to deliver on our promise of client-centric service delivery. Proud of our 100% client retention for 25 years (and counting! ), we invite you to browse our website and contact us to see what we can do for you and your transferring employees today.